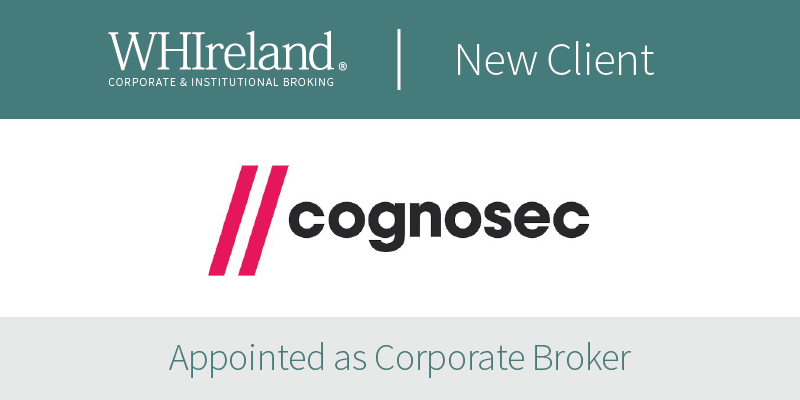 We are delighted to have been appointed as Corporate Broker to Cognosec AB. Cognosec AB (Publ) is engaged in providing cyber resilience solutions and conducts its operations through presences in Sweden, South Africa, UK, Kenya, Germany, Austria and the United Arab Emirates. Listed on Nasdaq First North (Nasdaq: COGS.ST) and as an American Depositary Receipt (OTCQX: CYBNY), the Group delivers services and technology licenses to enhance clients’ protections, against unwanted intrusions, to provide and enhance cyber resilience and to prevent various forms of information theft. WHIreland will provide research coverage and corporate finance advice in key areas to support Cognosec’s stated M&A strategy.